24 episodes, 72 minutes each, Chinese. Broadcast on Wednesdays and Thursdays until April 2013, 10pm on DRAGON-TV. Co-hosted by Cao Ke-Fan, Liang Zi Geng and Liu "Steven" Yi-Fan. Can't wait to upgrade to the version 6 of NUENDO!!! THE AMAZING RACE, China Rush ; season 3 - on AIR! Currently working on "THE AMAZING RACE, China Rush" season 3, as sound re-recording mixer! 12 episodes, Mandarin and English versions, 48 minutes each. On ICS every Sunday, starting from 26 August 2012! MASTERCHEF CHINA season 1 - on AIR! 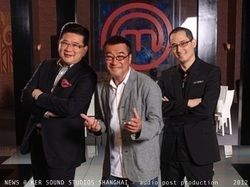 Currently working on MASTERCHEF CHINA, season 1, as sound re-recording mixer! On DRAGON-TV every Sunday 9:15pm, starting from 29 July 2012! KER SOUND STUDIO is currently working on the audio post production and original score of the 3D animated feature film "ZHENG HE: 1405". The movie is based on the story of Zhenghe, a Chinese navigator who sailed across the ocean seven times from 1405 to 1433. Original motion picture soundtrack by Greg Yu. Due in theatre in mid-2012 in Mainland China! Shanghai-based sound designer, drummer and percussionist. Co-founder of KER SOUND Studios.